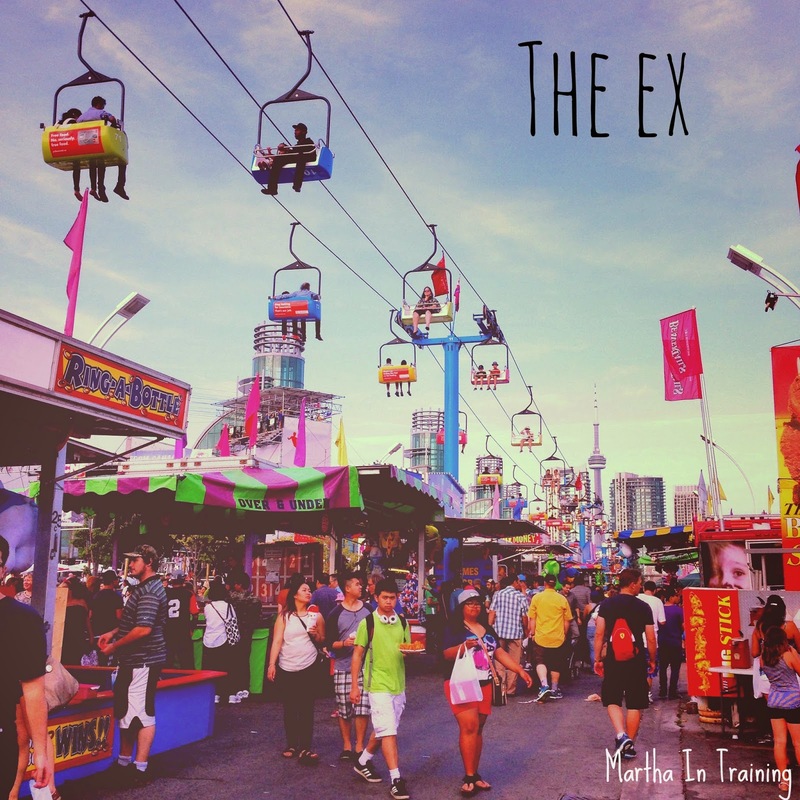 Martha-In-Training: Let's Go To (the food building at) The Ex! Let's Go To (the food building at) The Ex! Summer, for me, always wraps up with the opening and closing of The CNE - The Canadian National Exhibition, or The Ex. Even though we'll still have summer weather (and technically summer since fall doesn't start til later this month) for awhile longer, it always just feels like a summer full of long days and warm nights has wrapped up. This is extra ridiculous because the weather this summer hasn't been particularly hot. But today was a hot one. John and I made our way down once I finished work to take in the sights and sounds (and tastes, more importantly) of the Ex before it closed its doors for another year. I haven't been big on the rides since I was little - also cause as I get older the voice saying 'hey, this event runs for two weeks every year. How safe do you think these rides are?' gets a little louder - but this year I had a definitely excuse to stay off the rides. We did splurge on tickets for the ferris wheel though. I've always enjoyed it and it's great way to see the entire grounds and the masses of people. Plus Baby E seemed to enjoy it, as she gave me a few good kicks as we made our way down from the top. Then we walked around, watched some people play games at the midway. We saved our money for food. As always, I was excited to see what the new additions would be to the food building. The big ticket items were the Thanksgiving waffle, the chocolate fried chicken, the chunky Elvis grilled cheese & the spicy peanut butter sriracha rolls (both were no-goes on my list), the far east taco (like an Asian spin on the classic beaver tail), the butter coffee, and the crowbar. I had two of those things. I had to make a decision between the cocoa-infused chicken and the Thanksgiving waffle. I went with the chicken. The batter they use has - you guessed it - cocoa infused into it and then it's deep fried. It's amazing. We had an option of two dipping sauces. I forget what the other option was but I went all in and opted for the chocolate ketchup. If this comes back next year GO FIND IT. John went a different route (in hindsight he refers to it as the gut rot route) and got the colossal onion. It's a massive onion that they deep fry. Then you pull the pieces apart and dunk them in dipping sauce. It was like a big helping of onion rings but we only finished about a third of it before we had to say our goodbyes. This is a staple at The Ex so if you want one of your own, never fear. It'll be back again next year. The Crowbar. I tried to talk John into getting the butter coffee also being sold at this location but he was full with the onion. 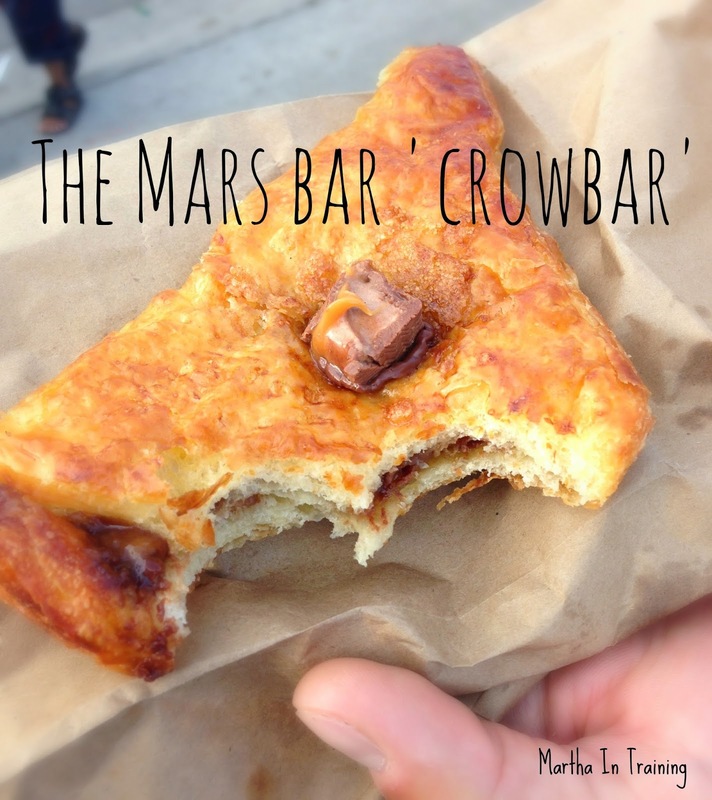 The crowbar is the beautiful love child of a chocolate bar baked into a croissant-like pastry. I went with the Mars bar (Caramilk, and Reese's Peanut Butter cup were also options) and was not disappointed. The cronut was the big hit last year and I missed it so I didn't want to pass up the chance to try the crowbar. I still have half sitting on the counter to be picked at and savoured over the next few days. So while my food samplings didn't quite rival that of other years, I'm pleased with my decisions. And even happier about an afternoon well spent with my main guy.